Hi, I'm the Pipe Guy! 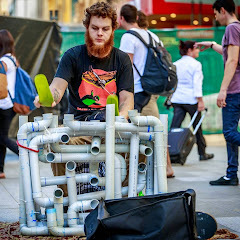 My name is Jake and I am a full time street performer from Adelaide, South Australia. I play instruments that I build my self out of PVC pipes and play them with thongs (or flip flops to you non-Aussies :P). I was inspired by The Blue Man Group when I saw their DVD. I have played drums for about 10 years and 2 years ago decided to build my own portable pipe instrument. I have made a few different models using different scales and am constantly experimenting with different ideas. I also play a handful of other instruments so this will be my outlet for any music I create as well as reviews for musical instruments/gear that I use.